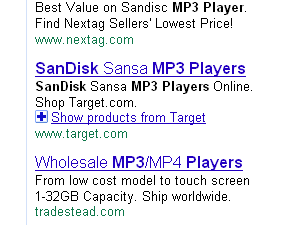 I did some searching on “sandisk mp3 player”. Such a specific search typically means I’m ready to buy. Note the the shopping results for target.com above. Not only did it tell me about specific models that Target has but I have links to find out about nearby stores. The way this is done is through Google Merchant Center. What you do is set up an account and then tell Google about your stuff for sale. Your shopping cart will need to have a feed that Google is told about for this to work. What has been challenging is that this is a fast moving feature that changes, so you need to periodically check that everything is working by searching for your own stuff. You don’t need to stop there however, you can also integrate Google merchant center with your Adwords campaigns. Here’s the same search, but this time we are looking the sponsored results in the right hand column. 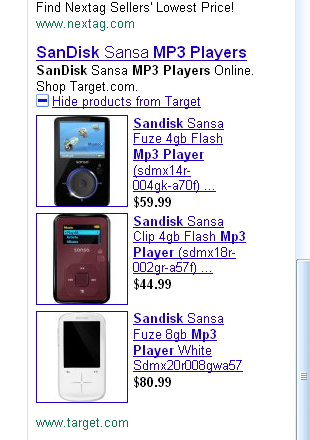 Note the “+” and the link “See products from Target”. 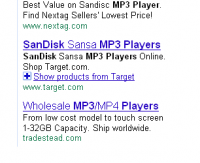 In this case Target has not only set up a Google merchant account with a feed from their shopping cart, but they have configured their merchant account with their Adwords Customer ID and also activated the Merchant as a “Product Extension” in Adwords. If you click on the plus sign in the sponsored listing, you get a list of the specific Sandisk MP3 players that Target has available. Clicking on one will take you to the individual product page at Target.com. With merchants having this sort of configuration ability, they will be less reliant on affiliates to sell their stuff. 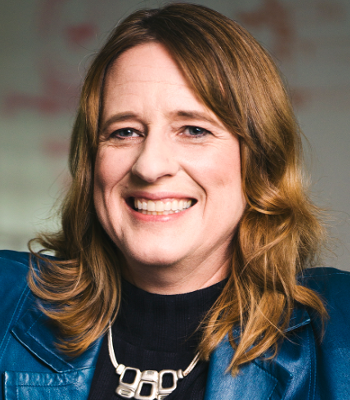 Google cuts out the middleman, the merchant gets a sale and everyone is happy except the affiliate. Affiliates may have to rely on building sites that deliver more high quality content and sell via editorial links, which of course would make Google happy as then it wouldn’t have to put up with the “content farm” complaints.